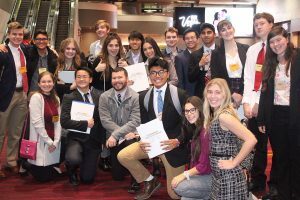 Students from across the valley participated in the 62nd annual Sun Youth Forum on Thursday, Nov. 29 at the Las Vegas Convention Center, lasting from 8:30 a.m. to 1:45 p.m. 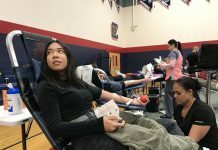 The entire event was designed to get students’ viewpoints on a variety of topics. 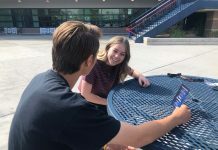 “Essentially, they want to hear the opinions from the youth of America on today’s issues as opposed to us old farts,” Mr. Giusto, Government teacher, said. Giusto and Mr. Johnson, History teacher, invited juniors and seniors to attend the Forum, but they could only take a small number. This year, it was took 25 students. 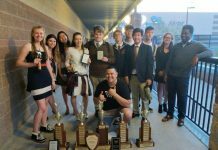 Topics ranged from Nevada issues, the United States, international problems, to teen topics like the accessibility to on-campus psychologists and social workers. Giusto and Johnson have advised and chaperoned this event every year for the past four years.